Have you heard any spring frog sounds so far this spring? Have you ever seen the tiny spring peepers as they make those big sounds? 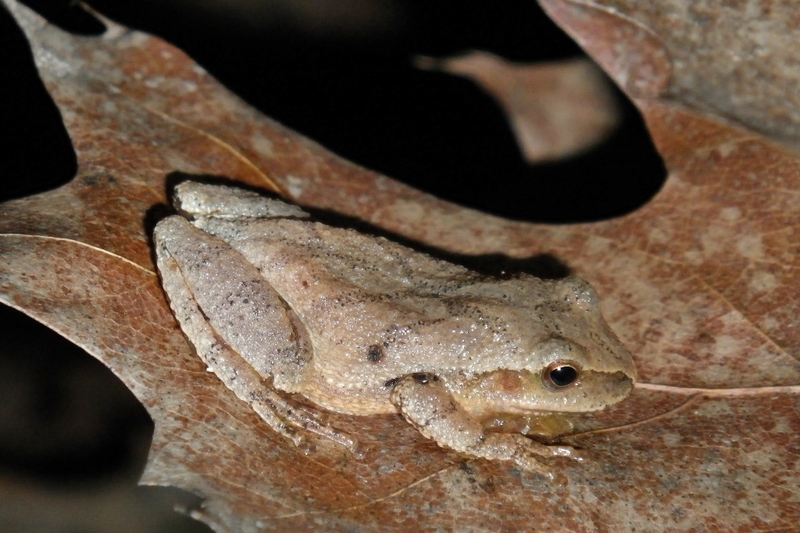 Right now, spring peeper sounds are the loudest part of that chorus of spring frogs... at least in our area. We have been hearing the spring peepers peeping for the last week. When I hear the spring peepers call, I delight in thinking about the way they makes those calls. 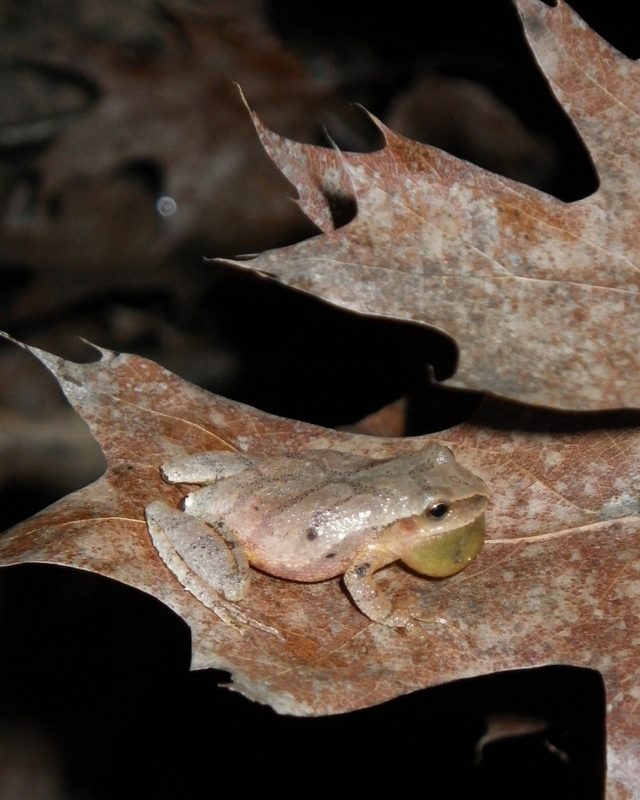 The following photos of spring peepers peeping, as well as video of spring peepers, are my attempt to show how the spring peepers make those spring frog sounds. This is a photo of a calling frog. 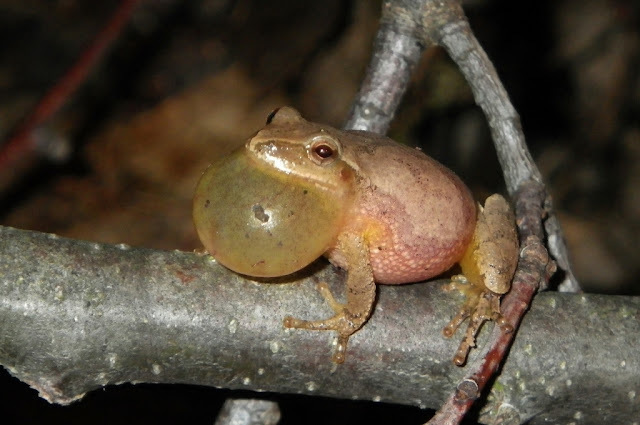 The photo shows a spring peeper with a fully inflated vocal sac. The frog has just made a "peep" by forcing air through its larynx and into its vocal sac. Then the air is passed back into its lungs... that is evident in the picture below... see the spring peeper's distended belly. This passing air back and forth from lungs to throat sac saves some of the frog's energy. What's more, this air recycling process is very intriguing to watch. 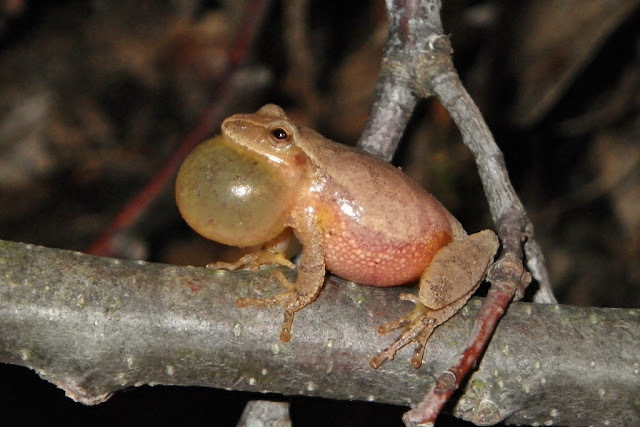 Here is a video of a spring peeper calling. Notice the way the frog forces air into its vocal sac as it calls and how the sac partially deflates and the frog's belly expands in preparation for the next "peep". Keep in mind the vocal sac also functions as a resonating chamber. Video of a spring peeper calling. Did you see the frog's belly lift off the twig every time he forced air into his expandable throat bubble? In this video clip the spring peeper is joining with a chorus of frog sounds in the background. 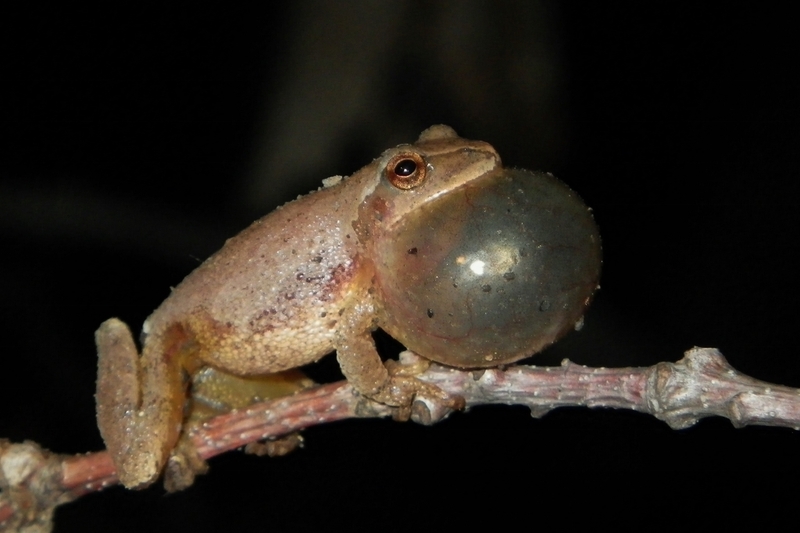 Here is a slow motion video of the spring peeper as it sings. Since the frog sounds are slowed down to 1/4 speed, they sound much lower. The slow motion video does allow a person to better visualize the flow of air from one air sac to other. My photos make the spring peeper look too big. They are very small frogs. Here is a photo of a spring peeper on an oak leaf. Spring peepers are small enough to sit on your thumb. Here is a photo of a spring peeper that is taking a break from calling. Cute little frog isn't it? I reckon the little frogs aren't so cute when they are all inflated with air while they are singing. If you have heard the spring peeper chorus but never seen them while they are calling, perhaps now you can picture what it looks like when a spring peeper peeps. No peeper sounds here yet Dana. Spring is very slow this year. I've heard then in past years but have never seen them. Thanks to you I now know what they look like. Thanks for the info. Our farm is called Spring Peeper Farm. We live beside a lake, stream and a swamp so not only do we mass produce mosquitoes and blackflies and export them all over the world (just kidding), In the spring time here you can't hear the TV over the peepers! They're so loud, but we love them because it means spring is here! But not so far.